You could sing just about any hymn to this passage! NCH387 / GtG361 / PH443 / GC(II)646 / RS782 / CP524 / Lau829 O Christ the great foundation (Timothy Ting Fang Lew) Excellent words of salvation and justice from Timothy Tingfang Lew, sung to the tune of "The church's one foundation" (AURELIA) which is in all standard hymnals. Lyrics There is a second possible tune (ABREU), which is more challenging. Note that the lyrics in the NCH are slightly different, and more inclusive. New words to old tunes. ATE 213 I go to the rock (Dottie Rambo) This just has the chorus, which is pretty old-school, but I think it still works OK. There are verses, but it's better without them. Good for kids. Lyrics. Dottie Rambo herself singing it! G(3)767 Called by Christ (Ruth Duck) A lovely song with a joyous chorus that feels like a good one to build community. "Built on the bedrock". Lyrics and lead sheet. Sound sample. TiS 669 / GGives2 Well Jesus is the rock (Mandy Treagus) Fun song for kids. Good for kids Lyrics, melody line and chords. Lyrics (downloads a word doc). *MV126 Are you a shepherd? (Ruth Duck) Good and joyous. Lots of images of God: shepherd, teacher, mother, father. We sung this once last year, and it would be good to do it again. A catchy chorus. Good for kids. 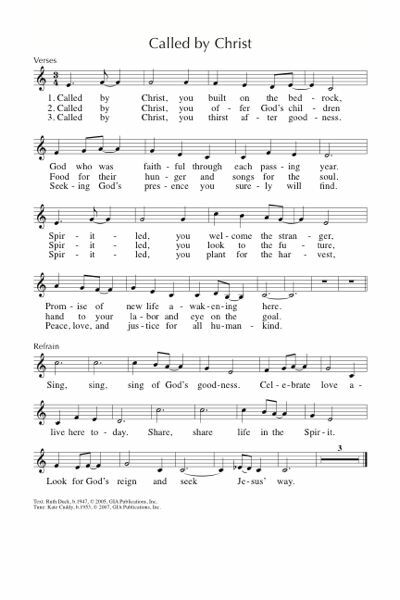 ELW438 / HPP52 / GtG803 / PH172 / Cha080 / PfAS023A / 82Hml-664 My Shepherd Will Supply My Need / My Shepherd You Supply My Need (Isaac Watts) I quite like this version of the 23rd Psalm, although hymnals vary widely in how inclusive their lyrics are; I prefer the Chalice version. The tune (RESIGNATION) is from Southern Harmony. Chalice also has a nice responsive reading (Cha081) that fits with this version. Oldy-but-a-goody. NCYC'07 Lead me on (Paul Gioia) A pretty cool gospel rock song. We used to sing this a lot, but not so much lately. Maybe worth reviving? PfAS023I My shepherd is the Lord (Ricardo Villarreal) I quite like this tune, and the paraphrase is good. It's particularly good for Spanish-speaking (or bilingual) congregations; it's fine in English too. Could also use the verses with a cantor. CH716 / VU374 / FFS10 / SFFS 2128 / W&R477 / Cha575 Come and find the quiet centre (Shirley Murray) A good song for the beginning of worship. We usually sing it to BEACH SPRING (TiS 493). Sheet music & lyrics. New words to old tunes. *Online Resource Breathe in the morning air (Helen Wiltshire) Lovely words for a soloist to sing at the start of a morning service to welcome the congregation. Sung to LOVE UNKNOWN. Free sheet music (downloads a whole book!). New words to old tunes. FFS39 It all depends on where I'm going (Colin Gibson) Good words of God's constant presence through all of life's travels, sung to a simple Celtic-style tune (TE HORO). Full music and lyrics here. The importance of love and generous living. GtB God is love and love is giving (Ross Langmead) A simple kids' song about God's love. A round. Good for kids. Sound sample. *CH115 / MV089 / Iona (Love from Below) Love is the touch of intangible joy (Alison Robertson) words of different kinds of love – deep friendship, romantic love (Love is the lilt in a lingering voice), and the love of God. Each verse ends with "God is where love is, for love is of God". Tune is simple enough for a congregation to sing first go, and it has gorgeous chords. Lyrics (loads a pdf). *ATAR656 Heavy our hearts (Trish Watts / Gabrielle Lord) A lovely soothing chant naming our heaviness and seeking God's shelter and healing. TiS 699 / AHB 571 / ATN 65 / WoV664 / GA318 / Srce35 / Lau920 / StF242 / MP001 A new commandment I give unto you (Unknown) Note that older sources do not have inclusive words, but more recent publications use "others" rather than "all men" to make it inclusive for all people. Oldy-but-a-goody. GA461 / G(II)445 / GC629 / GC(II)608 / G(3)699 God Is Love and all who live in love live in God (David Haas) This is a nice cantor and refrain piece. The refrain is very simple and the cantor part is inclusive. The words are really good. Lyrics. TiS 657 / CH263 / VU700 / A&M559 / AA50 / CP(E) 447 / Cha656 / SP242 God of freedom God of justice (Shirley Murray) Powerful lyrics. Can be sung to either TREDEGAR (new, but not too hard) or PICARDY (very familiar). Lyrics and sheet music. New words to old tunes. *Taizé / MV075 / StS079 / SFFS 2118 / GtG284 / GC(II)479 / G(3)547 / SP99 / URW395 Holy Spirit Come to Us / Veni sancte spiritus / Tui amoris (Jacques Berthier) Best if you have a cantor, but works well if you don't, too. Sheet music, translations, sound samples. *MV094 Love knocks and waits (Daniel Damon) Lovely words and a simple lilting melody. Sheet music and lyrics. TiS 630 / AHB 554 The law of Christ alone can make us free (James McAuley) Lyrics are not gender inclusive for God. The tune may be tricky if not familiar, so you may need to introduce the melody to your congregation. UMH592 / HPP548 / W&R555 / Cha470 When the Church of Jesus shuts its outer door (Fred Pratt Green) Sung to tune KING'S WESTON, this hymn has strong words of reproach and mission. Could work as a confession, sending out, or offering song. Lyrics. *MV126 Are you a shepherd? (Ruth Duck) Good and joyous. Lots of images of God: shepherd, teacher, mother, father. A catchy chorus. Good for kids. *Online Resource Christ is the shepherd strong (Brian Wren) Clear challenging words, set to a fairly simple tune. Verses focus on 4 images of Christ: Shepherd, Nurse, peaceful Prince and teacher. Lyrics and sheet music. TiS 420 Holy Spirit go before us (Elizabeth Smith) Great words of evangelism and justice to a simple lilting melody. If you think your congregation can't cope with a new tune this week, it can be sung to AUSTRIA (TiS 93). New words to old tunes. TiS 239 / AHB 185 / ATE 236 / NCH048 / StF252 / Lau746 / MP384 Jesus the Christ said "I am the bread" / Jesus the Lord said "I am the bread" (Unknown author / Urdu melody) This song set to a traditional Urdu melody is quite well nkown; translations vary a lot. I really like the translation in NCH. “The one good shepherd of the sheep am I”. Oldy-but-a-goody. TiS474 / AoV1-012 / ATAR595 / CH623 / SFFS 2236 / HPP553 / A&M363 / GtG401 / G(II)539 / GC839 / GC(II)743 / G(3)848 / CP465 / W&R649 / Cha284 / SP175 / URW054 / Lau475 Here in this place new light is streaming / Gather us in (Marty Haugen). Excellent words, very well known. “Nourish us well and teach us to fashion lives that are holy and hearts that are true”. Lyrics, sound samples, sheet music. What will you be singing? Please add it in a comment below. I'd love to hear your ideas, too!